Mavis Manor is a Queen Anne-style house at Flat Top, West Virginia, in Mercer County, on Flat Top Mountain. The house has been partly restored by the Marchese family under the supervision of Justyn J. Marchese, who had operated a bed-and-breakfast there through the first decade of the 2000s. The Mavis estate adjoins Winterplace ski area on the flank of Huff Knob (elev. 3,570) and is part one of the highest elevations in southern West Virginia. The house was built in approximately 1897 by Dr. Lonnie L. Lilly, a local physician, and included hospital rooms designed to lodge overnight patients. The house was constructed principally of oak and chestnut timbers harvested nearby in Summers County, milled in Hinton, West Virginia, and transported by horse-drawn wagon via the Raleigh-Wythe-and-Greyson Turnpike, along which the house was raised. 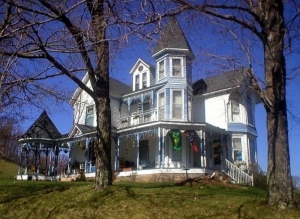 The fanciful house is one of few spindlework Queen Anne-style houses extant in southern West Virginia and includes a belvedere and three-story corner turret. Its eligibility for inclusion on the National Register of Historic Places has not been established.